Tertiary dentine forms when an odontoblast is directly affected by stimuli, commonly through occlusal wear and caries. In this study the presence of tertiary dentine was recorded in three South African fossil hominin species (Australopithecus africanus, Homo naledi and Paranthropus robustus), and two extant great ape species (Gorilla gorilla gorilla and Pan troglodytes). Frequencies of tertiary dentine were calculated for each species based on macroscopic observations of teeth with dentine exposed through occlusal wear. Overall, the three hominin species have similar tertiary dentine frequencies ranging from 12% to 16.13%. In contrast, over 90% of permanent gorilla teeth with dentine visible show tertiary dentine. Chimpanzees fall between these extremes, with 47.21% of permanent teeth affected. Deciduous teeth follow the same pattern. Species variances are not related to differences in occlusal wear. Instead, some species appear predisposed to produce tertiary dentine earlier/faster, or more often, than other species. Therefore, tertiary dentine formation has the potential to provide useful information on fossil specimens. For example, the uniformly low frequency of tertiary dentine formation in hominins may relate to diet, or be due to thick enamel having a similar role in preventing loss of function of teeth, i.e., extending the life of a tooth. In contrast, tertiary dentine is clearly an important mechanism for normal dental function in gorillas, and may have evolved to help maintain shearing function. Primary dentine is produced during tooth formation by odontoblasts and is succeeded by secondary dentine, which is an ongoing, slow process (Rutherford et al. 1995; Dean, 2017; Zuo et al. 2018). Tertiary dentine forms as protection against insult, caused commonly by excessive wear, microbial infection, and caries (Bjørndal, 2001; Fischer et al. 1970; Foster et al. 2013; Mjör & Karlsen, 1970; Ricucci et al. 2014; Stanley et al. 1966; Wennberg et al. 1983). As there is often confusion as to what this process should be called, it is referred to in this study as ‘tertiary dentine’ following Foster et al. (2013). The terms ‘sclerotic dentine’, ‘irregular secondary dentine’ and ‘reparative dentine’ have all also been used in the literature to describe this phenomenon (e.g., Ortner, 2003; Hillson, 2005; Dean, 2017; Stanley et al. 1983). Tertiary dentine can be formed in two ways: reactionary dentine occurs when new dentine forms from the pre-existing odontoblasts; and reparative, in which new odontoblast cells are formed (Ricucci et al. 2014; Carvalho and Lussi, 2017). In both types, tertiary dentine forms when teeth are directly affected by stimuli such as occlusal wear or caries, but microscopically the structure and characteristics of these different types varies (Goldberg, 2014; Neves and Sharpe, 2018). Which type of tertiary dentine forms depends on the severity and position of the stimuli (Schüpbach et al. 1992; Carvalho and Lussi, 2017; Goldberg, 2014). Occlusal wear can lead to the exposure of the primary dentine and, if the wear is severe, tertiary dentine may form as a mechanism to protect the pulp chamber (Geissler et al. 2015; Pampush et al. 2016; Zuo et al. 2018). The other main factor that can cause tertiary dentine is caries. Caries affects under 5% of teeth in these samples (Towle, 2017), and tertiary dentine in carious teeth are typically within a deep cavity and therefore only visible on CT scans or in histological specimens. A key diagnostic feature of tertiary dentine is that the color is distinct, and usually darker in appearance (Hillson, 2005). Therefore, from a macroscopic perspective, tertiary dentine is easily discernable as dark patches, usually visible in the same positions on the occlusal surface i.e., as an island on the occlusal surface above the pulp chamber. Pulp exposure can also lead to dark discoloration (Oxford, 2014). An easy macroscopic way to differentiate between tertiary dentine and pulp exposure is that the former is present on a flush surface, whereas a necrotic pulp generally has a depression in the dentine at the location of the pulp. The microanatomy of tertiary dentine has been researched in both humans and non-human animals. In particular, clinical studies have researched the properties of tertiary dentine formation, usually from an oral health perspective (Cox et al. 1992; Smith et al. 1994; Tarim et al. 1998; Ivanovic and Santini, 1989; Neves and Sharpe, 2018). In addition to darker coloration, tertiary dentine has fewer tubules and is denser in structure than primary dentine (Zuo et al. 2018). The type of stimuli causing tertiary dentine formation influences the structure and positon of deposits, and in general tertiary dentine prevalence and intensity increase with age in humans (Stanley et al. 1983; Carvalho and Lussi, 2017). Tertiary dentine is rarely reported in fossil hominins (Margvelashvili et al. 2013). Similarly, comparative studies have yet to be carried out on primates, although clinical studies involving specific captive non-human primates have been conducted (e.g., Duque et al. 2006; Rutherford et al. 1995). It is not known how the prevalence at different ages of tertiary dentine formation varies among wild primate groups or if certain groups may start to produce this form of dentine in response to stimuli at earlier ages than others. Specific genetic changes in animal models can increase tertiary dentine production (Neves and Sharpe, 2018). Therefore, it seems plausible that certain species may have evolved to produce this type of dentine in response to specific stimuli, such as a diet that leads to extreme occlusal wear. 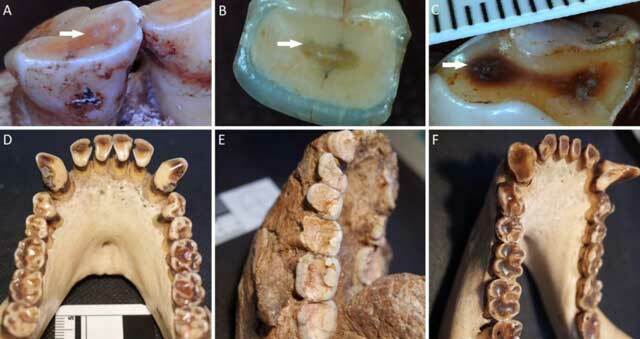 This study compares the prevalence of macroscopically-visible tertiary dentine in extant great apes and fossil hominins species using qualitative methods. The aim is firstly to see how variable hominids are in terms of tertiary dentine frequencies and secondly to test whether differences in formation frequencies may relate to diet or phylogeny across the five species studied. Since tertiary dentine forms as a response to stimuli, production may begin at earlier ages, or form more quickly, in species that have evolved to cope with abrasive or tough diets. Therefore, it is hypothesized that tertiary dentine frequencies will vary substantially with diet, with distinct differences between hominin genera, since dietary differences among these groups is well documented (Ungar and Grine, 1991; Towle et al. 2018; Daegling et al. 2013). Data were collected on South African fossil hominins (Paranthropus robustus, Australopithecus africanus and Homo naledi) and two extant great ape species (Gorilla gorilla gorilla and Pan troglodytes). The fossil hominin samples are curated at The Ditsong National Museum of Natural History in Pretoria and the University of the Witwatersrand in Johannesburg, South Africa. The extant primate material is curated at the Powell-Cotton Museum in Kent, UK, and specimens were shot in the wild in the first half of the 20th century (Guatelli-Steinberg and Skinner, 2000; Macho and Lee-Thorp, 2014). When stated as chimpanzees or gorillas this refers to common chimpanzees (Pan troglodytes) and western lowland gorillas (Gorilla gorilla gorilla) respectively. Chimpanzees and gorillas were chosen to compare to the fossil hominin due to the abundance of dietary data, and because of their close phylogenetic relationships. Additionally, there are substantial differences in diet between gorillas and chimpanzees, meaning dietary influences on tertiary dentine frequencies should be clear. In particular, compared with chimpanzees, gorillas infrequently consume hard seeds and fruits, and instead eat large volumes of low-quality herbaceous vegetation (Conklin-Brittain, Knott, & Wrangham, 2001; Doran et al. 2002; Galbany et al. 2016). A tooth was recorded in one of four categories: (1) no dentine exposed through wear, (2) dentine exposed through wear but no tertiary dentine present, (3) dentine exposed through wear and tertiary dentine visible, and (4) tooth not recorded due to postmortem damage. Only teeth that have dentine exposed on the occlusal surface through wear and are not damaged or obscured by postmortem damage were included in analysis, i.e., (2) and (3). Tertiary dentine was recorded as any obvious coloration changes, compared to primary dentine, that are clearly antemortem in nature (Figure 1). Occlusal wear typically creates a flat surface, in which tertiary dentine islands are clearly visible. The dark coloration of tertiary dentine is usually visible on specific positions on the occlusal surface, in particular directly above the pulp chamber (Hillson, 2005). Only clear areas of tertiary dentine that are visible with the naked eye were included. The severity of occlusal wear for each tooth was recorded following Scott (1979) for molars and Smith (1984) for all teeth as part of a separate study (Towle, 2017), allowing differences in wear between species to be examined. Statistical significance was tested between species using a chi-square test of homogeneity, with significance set at the ≤0.05 alpha level. A)Pan troglodytes lower right deciduous central incisor (specimen MER ii 27); B)Paranthropus robustus lower right central incisor (specimen SKX 3559); C)Gorilla gorilla gorilla lower left first premolar (specimen M 786); D)Pan troglodytes mandible (specimen M 425); E)Australopithecus africanus lower left teeth (specimen STS 7); F) Gorilla mandible (specimen ZI 17). White arrows indicate positon of tertiary dentine. Half of the teeth in the collections studied show primary dentine exposure through antemortem wear. A major issue in comparing frequencies of tertiary dentine is the amount of postmortem discoloration on many hominin teeth. Particularly common is for dentine islands on the occlusal surface to be stained but for the surrounding enamel to appear relatively unaffected (Figure 2). This staining is caused by taphonomic processes and involves the entire dentine surface and therefore does not resemble tertiary dentine. Teeth with such staining are excluded from analysis. The large size of the three collections of fossil hominin species studied means there is still a large sample for each. All tooth types from both the mandible and maxilla were examined, including both deciduous and permanent dentitions for the extant great ape samples, but just permanent teeth for the hominins due to sample sizes (Additional files 1 and 2). Table 1 shows the number of permanent teeth studied for each sample. Tertiary dentine forms similarly in deciduous teeth as in permanent teeth, although there are likely differences in certain characteristics (Klinge, 2001). Antimeres are included in frequencies and results are displayed per tooth rather than individual. Paranthropus robustus left upper first molar (specimen SK 57). Postmortem coloration covering a dentine island (white arrow). Number of permanent teeth for all samples studied, split by mandible and maxilla, as well as tooth type. M: molars; PR: premolars; C: canines; I: incisors. The three hominin species have very similar tertiary dentine frequencies, ranging from 12.00% to 16.13% in permanent teeth (Table 2), with no statistically significant differences among them (e.g., P. robustus vs. H. naledi: X2 = 0.326, 1 df, p = 0.5679). Gorillas have the highest prevalence with over 90% of permanent teeth with exposed primary dentine showing tertiary dentine islands. For chimpanzees, 47.21% of permanent teeth are affected. Deciduous teeth show the same pattern in great apes, with gorillas having the highest frequency (Table 3). There were not enough complete deciduous teeth with dentine exposed for the hominin samples for comparisons. Frequencies of tertiary dentine in permanent teeth. Only teeth with dentine exposed through wear on the occlusal surface included. Frequencies of tertiary dentine in deciduous teeth. Only teeth with dentine exposed through wear on the occlusal surface included. Figure 1 presents examples of tertiary dentine in different species (A-C). This figure also highlights the severity of tertiary dentine in chimpanzees (D), compared to the lack of tertiary dentine in a similarly worn hominin sample (E). Figure 1 also demonstrates that gorillas produce far more tertiary dentine for any given amount of occlusal wear than any hominin and chimpanzees (F). Differences in wear between species do not explain the large differences in tertiary dentine frequencies, with wear score proportions being similar among all species studied (Table 4; Towle, 2017). Figure 1 also highlights the difference in coloration of Tertiary dentine between samples, which is likely a consequence of structural differences. Interestingly, nearly all the gorilla examples are extremely dark, which may be caused by the amount of tertiary dentine formed or perhaps a denser tertiary dentine structure. A histological study is needed to provide further insight into the differences in properties of tertiary dentine between species. Combined maxilla and mandible mean wear scores for each species split by tooth type. Anterior teeth and premolars are recorded following Smith (1984) and molars following Scott (1979). Tertiary dentine is known to form as a response to stimuli, including occlusal wear (Bjørndal, 2001; Foster et al. 2013; Mjör & Karlsen, 1970; Stanley et al. 1966; Wennberg et al. 1983). However, whether species differences in tertiary dentine exist, and what may cause these differences, has rarely been explored. The results of this study show that diverse hominin species, from three genera, have similar, low, tertiary dentine frequencies. This is despite disparity in other dental properties, and dietary differences between these three genera (e.g., Towle et al. 2017; Ungar and Grine, 1991; Grine et al. 2012; Smith et al. 2015; Daegling et al. 2013). The hypothesis that differences in diet have led to substantially different tertiary dentine frequencies in hominins therefore seems unlikely. Instead, tertiary dentine is much more common in other great apes. This may relate to evolving to cope with different diets, or different ways to cope with similar dietary items. It may also relate to other features such as environment factors and exogenous grit. Therefore, diet may be important for controlling tertiary dentine rate on an evolutionary scale, especially in particular species, but in hominins either there has not been enough time for differences to evolve, or other mechanisms are more important. For example, tertiary dentine formation may be less common in hominins as a whole, with thick enamel potentially being responsible for extending tooth functionality, most notably in species such as P. robustus. 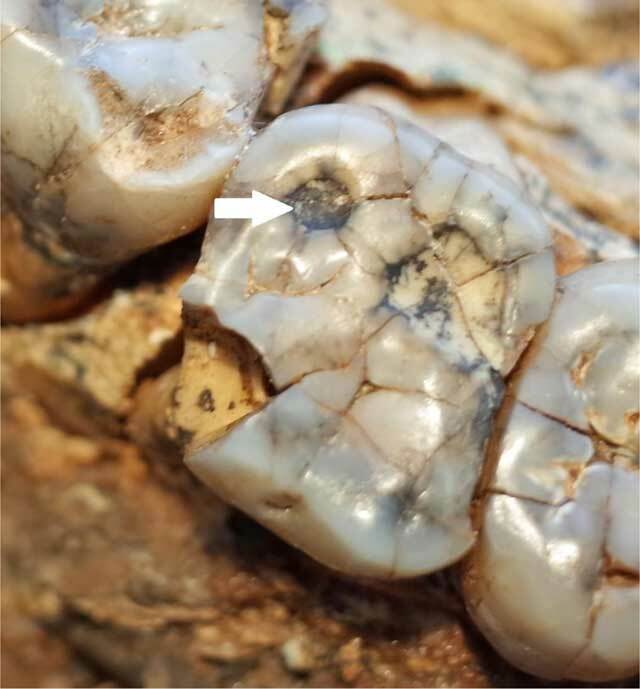 Another possibility is that because the hominin species studied here shared a recent common ancestor, differences in tertiary dentine formation had not had sufficient time to evolve. This could be tested by seeing if separate groups of captive primates of the same species, but with different diets, show different tertiary dentine frequencies. If not, this would suggest tertiary dentine is an evolutionary adaptation and not simply a consequence of an individual’s diet. Tertiary dentine differences between species are not related to tooth wear, with all species represented by similar proportions of wear stages that all cluster around the same mean. The deciduous teeth for the extant primate sample follow the same pattern as the permanent teeth, again suggesting species differences in the age at which tertiary dentine is formed. Differences in the speed of occlusal wear between species have been suggested as potentially influencing tertiary dentine formation, with wear that occurs too quickly potentially not allowing enough time for tertiary dentine to form (Fischer et al. 1970; Foster et al. 2013; Mjör & Karlsen, 1970; Ricucci et al. 2014; Stanley et al. 1966; Wennberg et al. 1983). The results of this study suggest that dentine properties are also crucially important, with certain species, such as gorillas, laying down tertiary dentine at earlier ages compared to other species. This likely relates to evolving mechanisms to produce new dentine in response to stimuli (Neves and Sharpe, 2018). Further histological studies are needed to support this finding, as this will allow microstructure differences to be compared (Smith et al. 1994; Tarim et al. 1998; Ivanovic and Santini, 1989; Stanley et al. 1983; Carvalho and Lussi, 2017). A potential explanation for the substantially different prevalence of tertiary dentine formation in hominids is evolving dental properties to cope with different diets. The high prevalence of tertiary dentine formation in gorillas has potentially evolved as a consequence of their diet high in tough vegetation, in which early/more tertiary dentine formation keeps the tooth functioning for longer. This hypothesis fits with other research that has found that, unlike other folivorous primates, mountain gorillas retain dental shearing function with age (Glowacka et al. 2016). However, the severe macrowear observed in western lowland gorillas compared to mountain gorillas has led researchers to suggest exogenous grit may be an important factor (Galbany et al. 2016). When frequencies for different hominin groups have been researched further conclusions on what the low frequency may mean in terms of diet can be explored. Additionally, once more extant primate species have been studied, and presuming dietary differences explain variation in tertiary dentine occurrence, inferences into the diet of fossil samples may be possible. The author thanks L. Berger and B. Zipfel from the University of the Witwatersrand, I. Livne from the Powell-Cotton Museum, and S. Potze from The Ditsong Museum of South Africa for access to their collections. This research was supported by a studentship from Liverpool John Moores University. Conklin-Brittain, NL, Knott, CD and Wrangham, RW. 2001. The feeding ecology of apes. The apes: Challenges for the 21st century, 167–174. Cox, CE, White, KC, Ramus, DL, Farmer, JB and Snuggs, HM. 1992. Reparative dentin: Factors affecting its deposition. Quintessence International, 23(4). Foster, BL, Nociti, FH and Somerman, MJ. 2013. Tooth root development. Stem Cells in Craniofacial Development and Regeneration, 153–177. Geissler, E, Duque, AC, Pampush, JD, Daegling, DJ and Mcgraw, WS. 2015. Spatial variation of dentine hardness in the molars of three primate taxa. American Journal of Physical Anthropology, 156: 142–142. Ortner, DJ. 2003. Identification of pathological conditions in human skeletal remains. Cambridge: Academic Press. Towle, IE. 2017. Dental pathology, wear and developmental defects in South African hominins (Doctoral dissertation, Liverpool John Moores University).